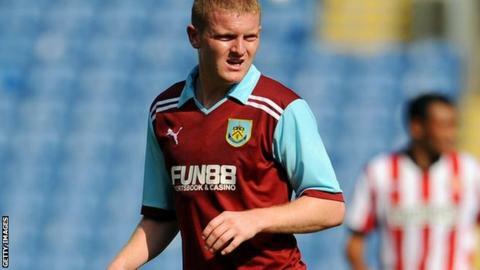 Dundee have signed Scotland B cap Brian Easton, the full-back who was released by Burnley at the end of last season. The 24-year-old spent three seasons at Turf Moor after leaving Hamilton Academical for a fee of about £350,000. He struggled to make an impact and made only 29 appearances during his time with the Championship outfit but thinks he can be a hit at Dens Park. "I played pretty regularly in the Championship last season and I've also in the SPL for Hamilton," he said. "So hopefully I can put that experience to good use here. "The boys made me welcome at my first training session this morning and it looked to me like there's plenty of quality here." Easton had been part of a golden triumpherate at New Douglas Park, the others being James McCarthy and James McArthur. However, while the two former Accies midfielders blossomed in England's top flight after their big-money moves to Wigan Athletic, the defender has returned to the Scottish Premier League in an attempt to resurrect his career. Dundee manager Barry Smith was pleased to secure the services of the Glaswegian who played twice for Scotland Under-21s and won a B cap against Northern Ireland in 2009. "He's a big lad, but he's also a very good footballer, he's comfortable on the ball and he'll be an asset to us," he told Dundee's website. Dundee chief executive Scot Gardiner believes his club are catching up after being late additions to Scotland's top flight after Rangers' financial collapse led to the Ibrox club playing in Division Three. "I'm very happy we have secured the services of a quality player like Brian, who is the seventh player we have signed in the last few weeks since being notified of our inclusion into the SPL," he added. "Along with Barry and the board, we are confident that, once the injury list clears up and the boys have the time to gel as a team, we will be able to push on and make our mark in the SPL this season. "I also wouldn't rule out further additions, but these will be within our budget as a fan-owned club."